"This manual celebrates human connectedness to the natural world. By putting the sciences and the arts together to restore land and bring it back to health, Steve and Alan guide us to manage the land and then to understand and love the land." "Infused with land ethic and solid ecology, this volume spells out a compelling process for restoration, from initial concept to planning, implementation, and long-term management. Everyone interested in the practice of restoration, professionals included, will appreciate the holistic vision of restoration and its societal role espoused in this book-length essay." "Restoring Ecological Health to Your Land provides critical insights into the real work of healing ecological functions of degraded landscapes. The authors are visionary practitioners who have amassed a wealth of hands-on experiences validated by long-term ecological monitoring. This book will assist private land owners, public land managers, and land conservancy stewards to design and execute restoration activities yielding ecologically significant results." "This down-to-earth book gives land owners the confidence and courage to initiate their own ecological restoration programs. The reader should be warned that Restoring Ecological Health to Your Land could easily inspire you to embark on a lifelong, learn-as-you-go adventure on your own land that's guaranteed to keep your brow sweaty, your knuckles dirty, and your spirit soaring." "Ecological recovery are what many places need to recover their natural beauty. Restoring Ecological Health to Your Land is a guide to restoring ecological areas where urbanization has caused environmental decay. With chapters discussing many types of areas from plains to forests, and step by step plans to tracking progress, Restoring Ecological Health to Your Land proves to be a powerful reference and guide, highly recommended to any in charge of overseeing such projects for its comprehensive collection of tips and advice." "Landscape architects, who increasingly get a significant percentage of business from restoration, will find this thorough, replicable process valuable, whatever their experience level. Professionals will benefit from the authors' insistence on monitoring measurable results: Too many of our ecological and sustainable projects never receive this validation, even from LEED and its offspring." "Steven Apfelbaum and Alan Haney are both seasoned restoration practitioners from Wisconsin, a heartland of North American restoration practice and science. They write about restoring land on small, private holdings. The authors provide step-by-step guidance on executing and monitoring the restoration of grasslands, forests, wetlands, riparian areas, and even desert areas. It is a well-written, well-produced, and authoritative book, which I recommend wholeheartedly for readers with no appetite to tackle the specialized literature, but who have restoration projects in mind, at heart, or underway, especially on their own land." "Overall, I would think that this book is a useful primer for undergraduates studying ecological restoration or restoration ecology. The first part is generic and could be used anywhere in the world; the latter half is heavily focused on North America. It is very well written, and it is clear that the authors have lived and breathed the subject. Anyone involved in teaching this subject should have a copy for inspiration and ideas." "A useful volume, modesty priced by a non-profit making publisher." 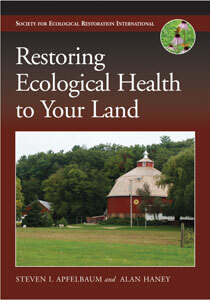 "Restoring Ecological Health to Your Land offers a practical, nontechnical guide to ecological restoration of damaged lands—a field that barely existed 30 years ago when coauthor Steven I. Apfelbaum bought 80 run-down acres in southern Wisconsin. Apfelbaum (of Applied Ecological Services) and Alan Haney (fomerly of the University of Wisconsin-Stevens Point) explain how their 10-step process was applied to the Wisconsin property and show how it could apply to grassland, forest, wetland, stream, and desert ecosystems as well...Any nonbiologist charged with dealing with land will benefit from this book." "...the wealth of information in this workbook makes it a valuable resource even for experienced restoration ecologists." "...even individuals who have been conducting restoration projects for years may appreciate the structure and rigor outlined in the Workbook. For the less experienced restorationist, Restoring Ecological Health may provide just the motivation needed to get started, and the Workbook presents a recipe that, followed carefully, is virtually guaranteed to succeed." Throwing Everything at the Land? -Is There Ever an Endpoint?